Author(s): Kashif Gul, Institute of Chemical Sciences, University of Peshawar, Pakistan. Saima Sohni, Imtiaz Ahmad, Nimat Ullah Khattak, Rifaqat Zada, Nageena Akhtar, Noor Bahisht. Background: Effluents from textile industries is considered to be one of the most challenging industrial wastewaters to treat. The utilization of nanomaterials in various waste water treatment processes has gained tremendous attention in the recent past. Graphene is one such promising candidate for wastewater decontamination. Methods: In present study, Graphene/Fe3O4 nanocomposite (G/Fe3O4) as adsorbent has been synthesized using a simple chemical route and characterized by scanning electron microscopy (SEM), Fourier transform infrared spectroscopy (FTIR), x-rays diffraction (XRD), energy dispersive x-ray (EDX) and thermogravimetric analysis (TGA). Batch adsorption experiments were carried out for the removal of two typical textile dyes, i.e. Acid red- 17 (AR-17) and Remazol brilliant blue R (RBBR), from their spiked aqueous solutions. Influence of pH, contact time, dosage of G/Fe3O4 and initial concentration of dyes was studied for maximum adsorption of dyes. To understand interaction and kinetics of dye removal, isotherm and kinetic models were applied to the adsorption data. Results: The extent of adsorption was found to vary with initial pH, contact time, amount of G/Fe3O4 and dye concentration. Kinetic studies revealed that G/Fe3O4 synthesized could well remove high concentrations of both dyes in a short period of time. The results indicate the Freundlich isotherm as best fitting model. Moreover, adsorption accorded well with pseudo-second order kinetic equation. Conclusion: The results present the potential of G/Fe3O4 nanocomposite as a versatile adsorbent for remedying wastewater in terms of hazardous pollutants. Keywords: Acid red-17, adsorption, freundlich isotherm, graphene/Fe3O4 nanocomposite, remazol brilliant blue R.
Affiliation:Institute of Chemical Sciences, University of Peshawar, Pakistan. Keywords:Acid red-17, adsorption, freundlich isotherm, graphene/Fe3O4 nanocomposite, remazol brilliant blue R.
Abstract:Background: Effluents from textile industries is considered to be one of the most challenging industrial wastewaters to treat. The utilization of nanomaterials in various waste water treatment processes has gained tremendous attention in the recent past. Graphene is one such promising candidate for wastewater decontamination. 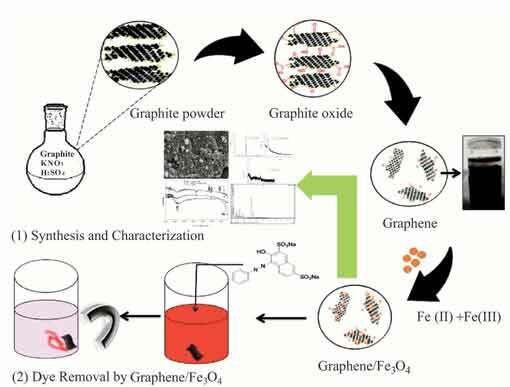 Methods: In present study, Graphene/Fe3O4 nanocomposite (G/Fe3O4) as adsorbent has been synthesized using a simple chemical route and characterized by scanning electron microscopy (SEM), Fourier transform infrared spectroscopy (FTIR), x-rays diffraction (XRD), energy dispersive x-ray (EDX) and thermogravimetric analysis (TGA). Batch adsorption experiments were carried out for the removal of two typical textile dyes, i.e. Acid red- 17 (AR-17) and Remazol brilliant blue R (RBBR), from their spiked aqueous solutions. Influence of pH, contact time, dosage of G/Fe3O4 and initial concentration of dyes was studied for maximum adsorption of dyes. To understand interaction and kinetics of dye removal, isotherm and kinetic models were applied to the adsorption data. Results: The extent of adsorption was found to vary with initial pH, contact time, amount of G/Fe3O4 and dye concentration. Kinetic studies revealed that G/Fe3O4 synthesized could well remove high concentrations of both dyes in a short period of time. The results indicate the Freundlich isotherm as best fitting model. Moreover, adsorption accorded well with pseudo-second order kinetic equation. Conclusion: The results present the potential of G/Fe3O4 nanocomposite as a versatile adsorbent for remedying wastewater in terms of hazardous pollutants.